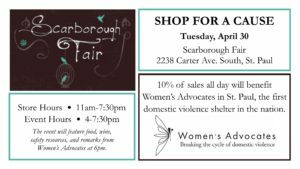 On Tuesday, April 30th, 10% of sales ALL DAY (11am-7:30pm) at Scarborough Fair, 2238 Carter Ave South in St. Paul, will benefit Women’s Advocates, the nation’s first shelter for domestic violence victims. Additionally, Scarborough Fair will host a shopping event that evening (4-7:30pm), where food & wine will be served. Extra staff will be on hand to help shoppers and Women’s Advocates’ team members will be available with safety resources and a few remarks (~6pm).